The Camera Link interface appeals to the imaging professional. The signals are derived virtually directly at the image sensor, providing fast access to the image data. Latency and image distortion caused by the camera are essentially ruled out with this standard. The low voltage differential signals, LVDS, transmitted through the Camera Link cables have a low EMC susceptibility. However, a special frame grabber is required in the PC host. Using the Dual Camera Link standard (CL Medium and Full), data rates up to 850 MB/sec are achievable. Official logos for Camera Link and the Power-over-Camera Link (PoCL) standard. The CL standard was first introduced in October 2000 by AIA, the Automated Imaging Association. With Camera Link rev. 1.1, the generic programming interface, GenICam, was added, allowing compliant devices and hardware to be controlled by conforming software. All SVS-Vistek cameras are GenICam compliant. With the release of Camera Link Rev. 1.2 in 2007, additional features were incorporated by AIA. Noticeably Power-over-Camera Link, PoCL. With this addition and ever increasing data rates (from Base, via Medium up to Full and Deca configuration), higher performance is required from the grabber. EURESYS, SVS-Vistek’s innovative partner, is providing excellent support for all of our high end Camera Link cameras covering all of their features. 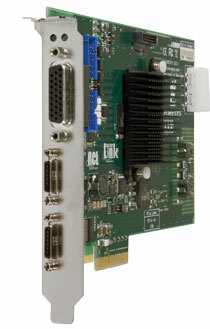 The Camera Link interface is aparallel interface using LVDS signals. In the same sequence as the pixels are read out from the sensor, they are transmitted over the Camera Link cable. To suppress external influences on the streamed bits, the signals are “mirrored” and sent as a differential pair to the grabber. While electro-magnetic interference, EMI, always has an additive or subtractive effect, the difference between the signal pair remains uninfluenced. Together with the pixel data, Camera Link also transmits a synchronization clock ensuring precise re-assembly of the data in the frame grabber. Corrupted or lost data (as seen in GigE Vision) is not at all likely to happen in Camera Link. Camera Link data rates are governed by the combination of sensor and standard performance. The sensor’s pixel clock correspondingly dictates the transmission rate of the Camera Link interface. The number of data pairs in the cable reflects the maximum bandwidth. Dual Camera Link provides twice the number of cable pairs with a second interface cable. The standard nomenclature for Camera Link variants is “Base” (24 bits per clock cycle), “Medium” (up to 48 bits per clock cycle) and “Full” (up to 64 bits per clock cycle). Camera Link Medium and higher requires two cables for data transmission, i.e. dual Camera Link. Frame grabber from Euresys: Grablink Full XR – Extended Reach for cable length up to 30 m.
While the chip set used for Camera Link requires very little space, SVS-Vistek cameras with Camera Link have lower power dissipation than cameras equipped with other interfaces, e.g. GigE Vision. This is why Camera Link cameras are so well suited for space-constrained applications. Image processing is done remotely from the image acquisition. In addition to streaming raw data from the sensor, SVS-Vistek also offers Camera Link cameras capable of performing simple image correction pre-processing (e.g. hot pixels) in the camera. The standard cable contains 26 individual leads. They are organized as twisted pairs, transmitting pixel data, sync and camera control (CC) signals as well as bi-directional serial communication. PoCL requires minimum 2 extra lines. The Camera Link standard specifies that the cable pairs be shielded. An addition, AIA also stipulates a secondary EMI shielding of the complete cable.